Welcome to the official Square Foot Gardening Forum. There's lots to learn here by reading as a guest. However, if you become a member (it's free, ad free and spam-free) you'll have access to our large vermiculite databases, our seed exchange spreadsheets, Mel's Mix calculator, and many more members' pictures in the Gallery. Enjoy. » Hello from Southern Illinois! » Northern California & Coastal Valleys - What are you doing this month? » How's the Weather Where You're At? » April Avatar: Spring is HERE! » Anybody Make or Use Homemade Bar Soap? 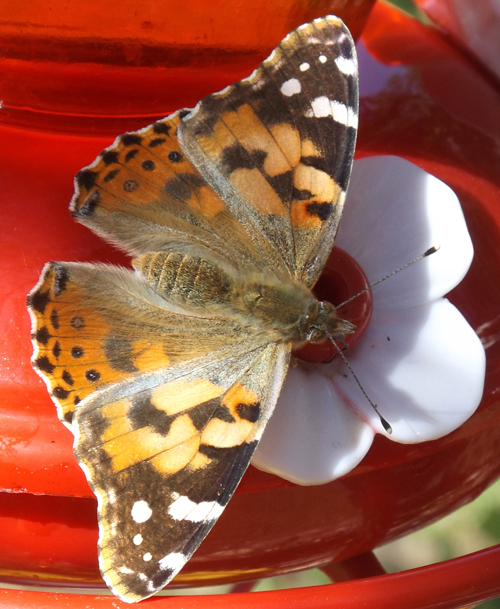 » What are you eating from your garden today? » Mel's Mix. How strong is your backbone? » Sugar Magnolia snap peas, anyone? Suz, an easy (to me!) chicken-wire cage is pictured in the Third Edition. Also, do you store your seeds in the fridge? I do, and have had good germination rates. This year, though, I'll test a couple of packs from 2008-2009 and see what the results are. @donnainzone5 wrote: Suz, an easy (to me!) chicken-wire cage is pictured in the Third Edition. Any cages I use must be ornamental, since this garden is in the "formal" backyard (pool area). Nope, no seeds in the fridge. I never had room before, but the new fridge that we bought when we moved in, actually has the perfect little shelf for them, so I will start doing that. Do you keep all of your seeds there all year long? Most of my seeds remain in the refrigerator 24/7, although when I take them out to do inventory or some planting, I sometimes forget or neglect to return them. So far, I haven't noticed too much difference, although time will tell. I do believe that refrigeration, as Mel recommended, is advisable. If I find any aesthetically pleasing covers, I'll let you know. Started onion seeds today, per OG's instructions in the Seed Starting thread. My heating pad is a cheaping with no thermostat, so I can't control that part, but the seeds are fresh and I just patted them down onto the top of the soil and covered lightly with vermiculite. My seed starting table is under a west-facing window, so everything gets some light. Do I need to add the grow lights now or can I wait until the seeds start to sprout? I didn't know there was going to be a test or I would have studied. Okay, I dug out the book and read what Mel said about refrigeration. I hope plastic bags are as good as glass jars because they suit my system better. I have the perfect little door shelf at the bottom where Hubby didn't even know it was there. It will be perfect for organized seed packets. Thanks, Donna. Suz, I separate each type of seed packet and place them in good-quality quart-sized freezer bags, which I then label with a waterproof pen. Examples: corn pole beans bush beans tomatoes cukes leaf lettuce , etc. I have so many seeds for lettuce and other greens that I think I'll put them all in a large Christmas cookie tin. Some, however, remain in the box a toaster came in. Fortunately, I have a large (27 cubic foot) fridge. The seeds still take up a great deal of space! @donnainzone5 wrote: Suz, I separate each type of seed packet and place them in good-quality quart-sized freezer bags, which I then label with a waterproof pen. I will have to be selective. There's no way all of my seeds will fit, but that's fine. Suz, those boxes look neat! Onions, marigolds, tomatoes, and zinnias are starting to sprout. Baby cabbage, baby pak choi, and romaine transplanted into permanent balcony containers. Baby turnips direct sown into balcony container. Sugar snap peas planted in old peat pots. Hopefully they'll be ready to go into the Salad Bar. along with the kale, after this patch of rain ends on the 29th. Wow, you have been busy!!!! @ralitaco wrote: Wow, you have been busy!!!! I'm like a little kid at Disneyland. I lost a whole season and now I just can't wait to make it up. YEE-HAH! Went to a going-out-of-business sale and scored Yukon Gold seed potatoes for $1.98 a pack -- regularly $7.99. There are about 4 to a pack. Not sure if the price is good, but they're hard to find around here at any price, so I'm jazzed. I know right where to put them to keep them away from the deer, too. Now I need a sweet potato from the grocery store and I'm all set for taters. Worst hail I've ever seen. Here is the master bedroom balcony, with baby cabbage and baby pak choi in the containers. Here is the kitchen balcony, with romaine in the planter boxes. A gardening I shall go! Mother Nature took pity on me and dried up the rain a little early. After dumping another ton last night, this morning is starting to dry up a little and we have SUN scheduled for this afternoon and THE WHOLE ENTIRE WEEKEND! I should have time to finish prepping the Salad Bar and get all of my seedlings in the ground (including an onion box on the kitchen balcony). Hopefully, I can also get the host garden cleaned up and my milkweed planted. Then, when the rain comes back next week, I can start another batch of seeds inside, while I got back to my knitting. You have an artichoke plant! None of the nurseries here have them in stock. 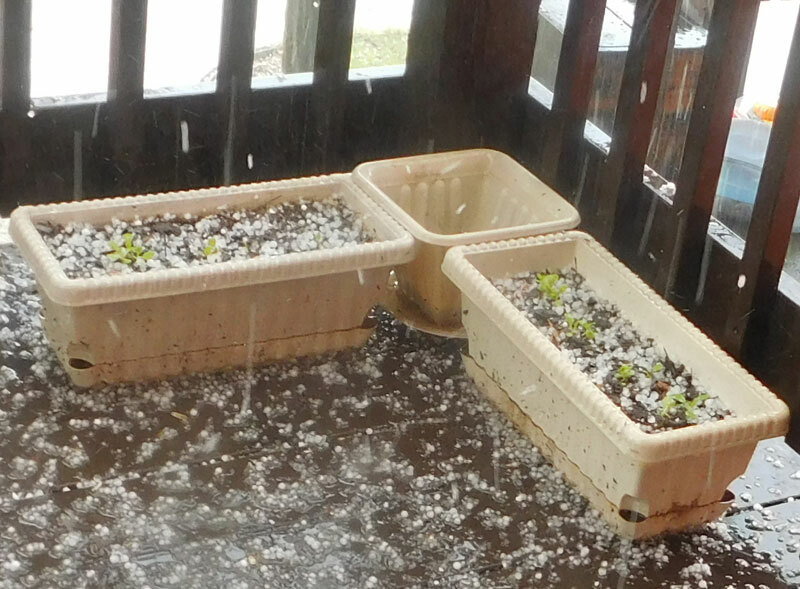 That's some hail, there. 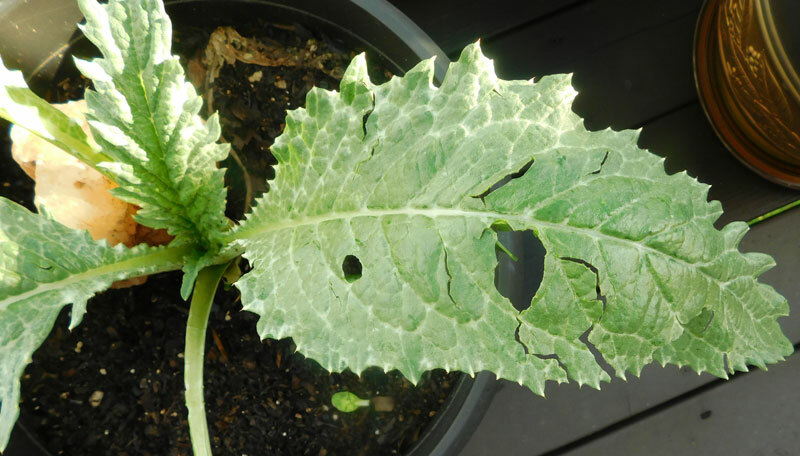 @sanderson wrote: You have an artichoke plant! None of the nurseries here have them in stock. 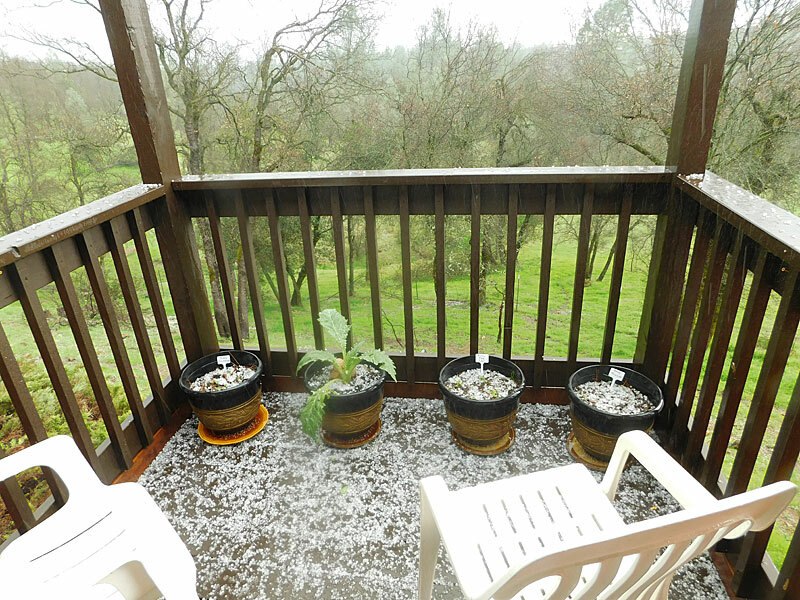 That's some hail, there. I planted that poor thing from seed over a year ago. It was the only one to sprout. The plants I bought died when we had to evacuate for the Carr Fire. That poor little guy survived. I up-potted it. Then it went through the snow storm. Now it's the hail. Do they make a purple heart for plants? April 2 and I'm setting up grow lights. Grrrr! There have been years when I was already working in the ground on Feb. 2. All those tiny seedlings I planted on the balconies last month are still sitting there. They aren't dying, but there's been no appreciable growth, either. My asparagus bed is still dormant. Daffodils are still blooming. I swear it's like living in the movie Ground Hog Day. I've been re-living the same weather day for over a month. Thanks, Ralitaco. I needed a little encouragement. Also, love your avatar. It gave me a nice, big smile -- also much needed, today. Learn something new every day! Did you know that if you start melons from seed inside, you should get them in the ground within 2 weeks. Baker Creek says never let them become pot-bound. That explains a lot. Many times I started them way early to get a headstart and could easily have let them get pot-bound. Or . . . bought bigger plants from a nursery that were already pot-bound before I got them home. Or . . . bought nursery plants, then left them outside for too long without planting them. Then I wondered why they failed. At least that's one lesson I won't have to learn again. @countrynaturals wrote: Learn something new every day! Did you know that if you start melons from seed inside, you should get them in the ground within 2 weeks. Baker Creek says never let them become pot-bound. That explains a lot. Many times I started them way early to get a headstart and could easily have let them get pot-bound. Or . . . bought bigger plants from a nursery that were already pot-bound before I got them home. Or . . . bought nursery plants, then left them outside for too long without planting them. Then I wondered why they failed. At least that's one lesson I won't have to learn again. Caught a break in the weather and started my melon seeds in big peat pots, so I can keep them inside until May 1 without worrying about them getting pot bound. MonarchButterflyGarden.net wrote: Some plants, including onions and marigolds, have been shown to repel aphids and naturally reduce their numbers. Planting these repellents close to milkweed can attract more butterflies while keeping aphid numbers down to reasonable levels. Since this is the "year of the onion" for me, and since I had to start over with milkweed, I'm gonna intersperse my baby milkweed plants with some of my baby onions, in my host garden. Fingers crossed. If this works, I will definitely share. 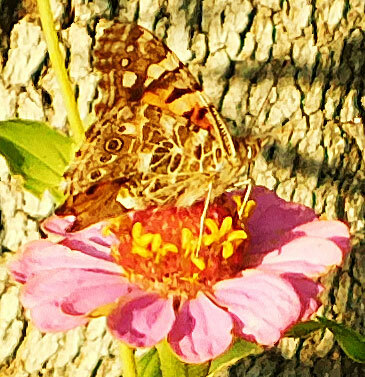 April 9, 2019 -- 1st butterfly sighting -- Painted Lady. Boy, these early ones are fast.